Did you know that every day of the year is dedicated to some sort of food holiday? I'm usually late to know or remember what they even are, other than the only unofficial food holiday that I actually plan ahead for - Thanksgiving. It's usually only because of my Twitter or Instagram feeds that I wake up to find out that it's International Pancake Day or National Hot & Spicy Day, or that November is "National Fun with Fondue Month." Seriously, there is a celebration for all things food. 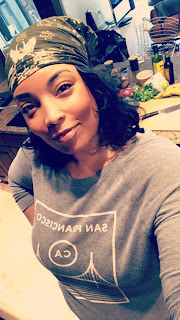 As a food blogger, it's impossible to have something in store for every single holiday, but when I found out that today is National Sandwich Day, I knew this one was in the bag. I adore sandwiches. They tend to be a go-to meal when I'm home during the day for breakfast or lunch. I rarely make the same sandwich twice, as they are usually a perfect opportunity for me to be spontaneous and creative with what I have in the fridge. For that reason I'm short on sandwich recipes for my blog. Time to change that. My absolute favorite sandwich all year is the one I make with Thanksgiving leftovers. You know the one - turkey, cheese, stuffing, cranberry sauce, olives, mayo and whatever else I can fit in there from Turkey Day. 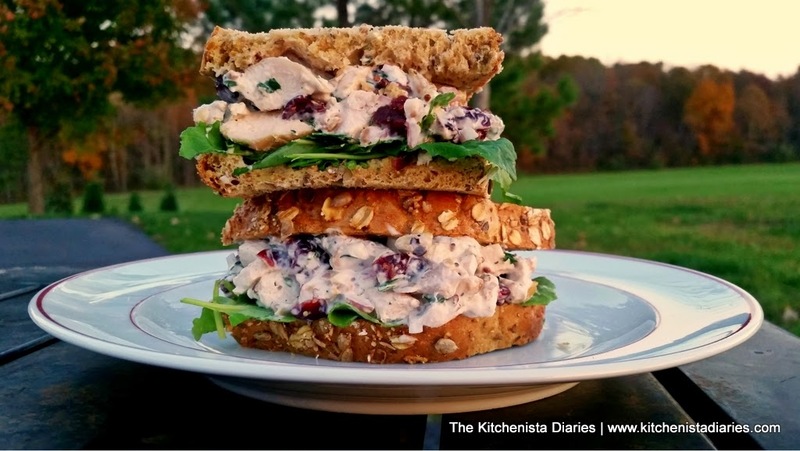 A close second to that is a sandwich that's reminiscent of the Thanksgiving flavors with ingredients that are a little easier to come by throughout the fall and winter season - roasted turkey, brie cheese, cranberry chutney, arugula and a smidgen of dijon mustard. I make it on the grill pan or skillet like a grilled cheese sandwich to let the brie melt, and it's just the most amazing, decadent thing ever. I'm drooling just thinking about it again. I roasted a chicken for dinner last night, so when I was brainstorming last minute sandwich ideas I knew I wanted to use up my leftovers. Naturally, chicken salad came to mind. 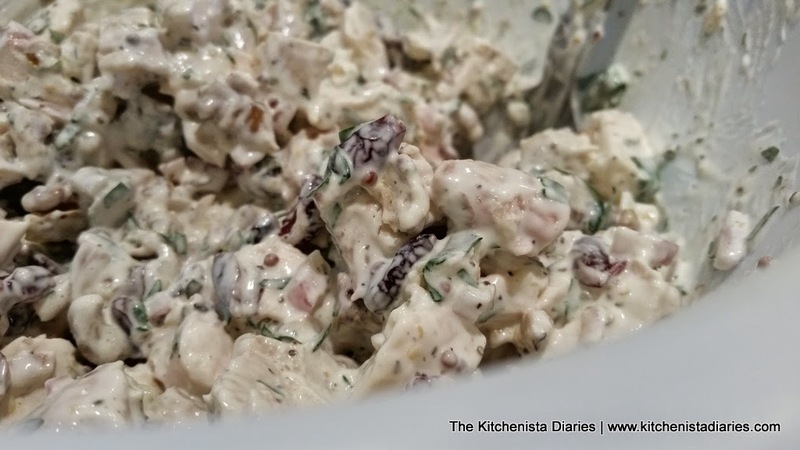 I don't believe in making chicken salad too complicated, but I do believe you can upgrade your memories of canned chicken drowning in mayo. 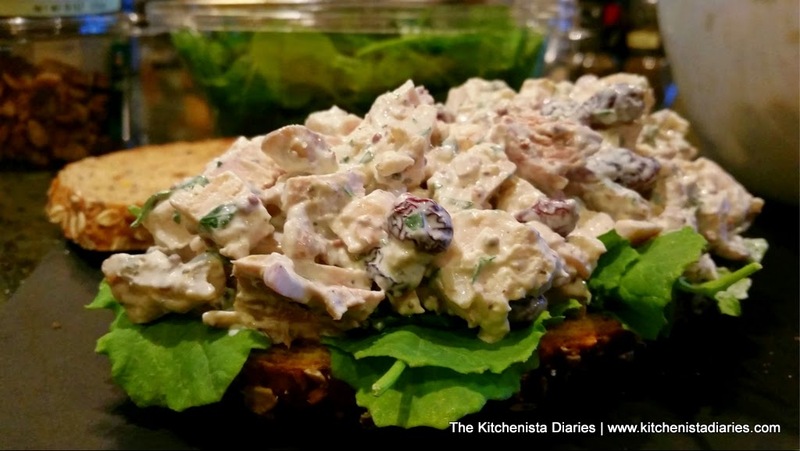 My grandmother always made a great chicken salad that had grapes in it, and that's still one of my favorite ways to enjoy it. 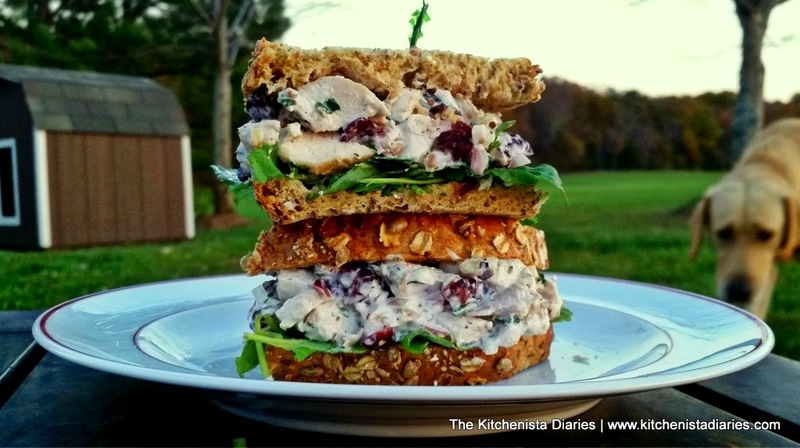 For this sandwich, I thought I'd give a nod to the fall season and work with cranberries and walnuts. 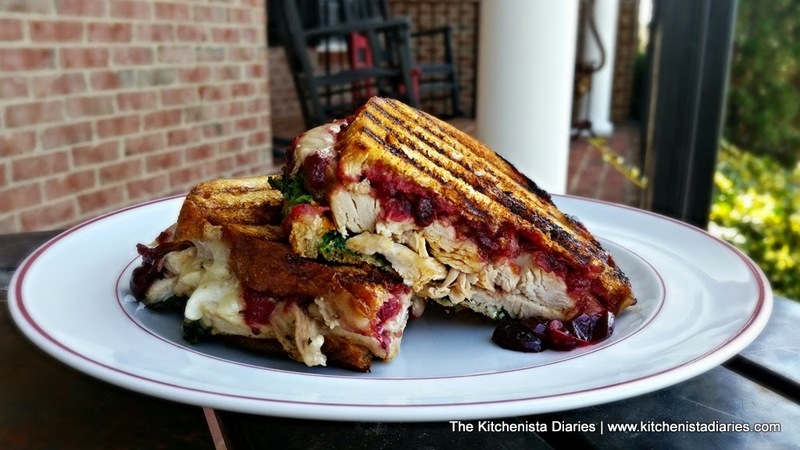 The flavor profile reminded me of my turkey, brie & cranberry chutney sandwich, but much lighter. I even snuck in some Greek yogurt in place of half the mayo and you'd never know the difference. It sounds obvious, but good chicken is the key to a great chicken salad. I prefer to use a mix of roasted chicken breast and thighs. Poached chicken breast also works, as does grilled chicken. 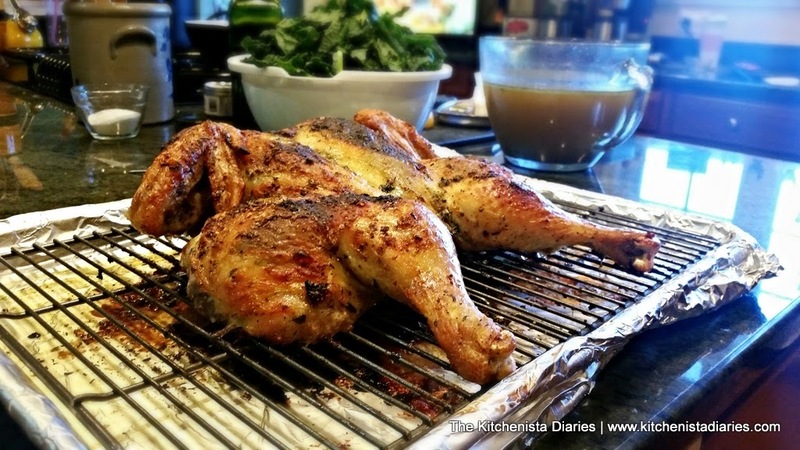 If you're looking for a real shortcut, a store bought rotisserie chicken is your best bet - but if you have the time, roast a whole chicken yourself at home. 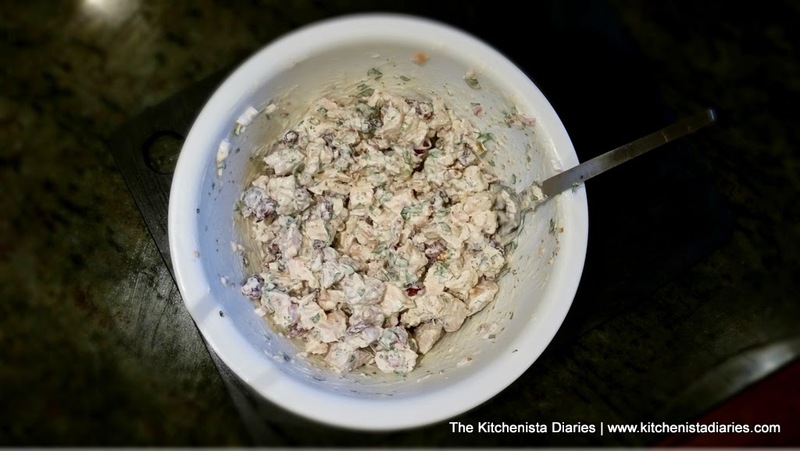 If you've cooked the chicken yourself, just make sure it's cooled completely before making your chicken salad. 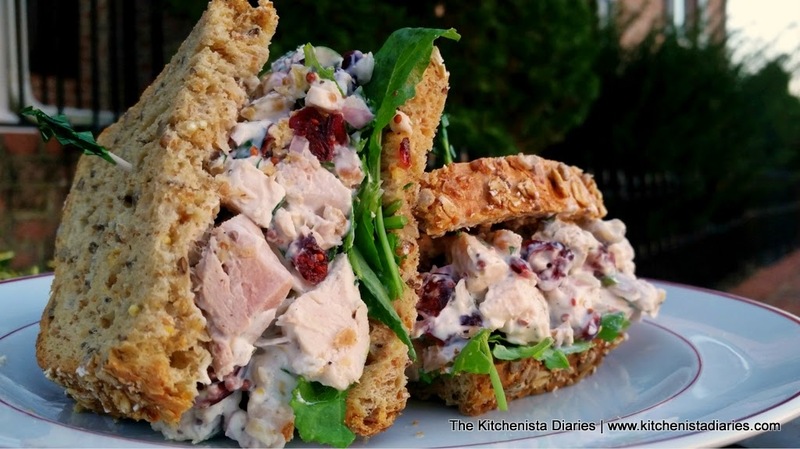 This is one of those sandwiches that's great to make when you have leftovers in the fridge! 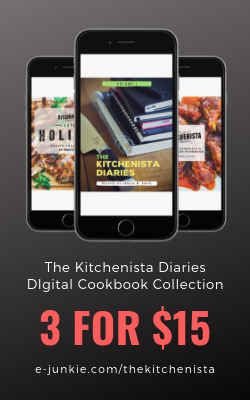 It's super economical to cook your own whole chicken, and for a small family you can usually get several meals out of it. I used 1 large breast and 1 thigh, skin removed. When I'm making any kind of salad that will be tossed in the dressing, I mix the dressing first to make sure the flavors are right. 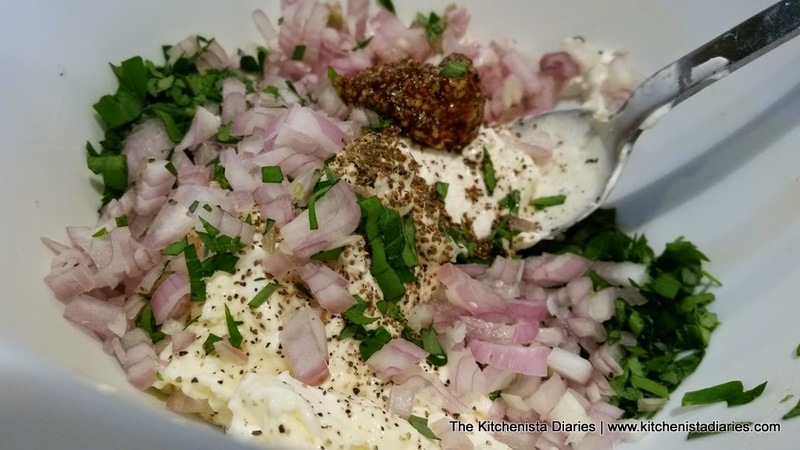 In a small bowl, add the mayo, Greek yogurt, vinegar, mustard, celery seed, shallot, and herbs with a healthy pinch of salt and plenty of cracked pepper. 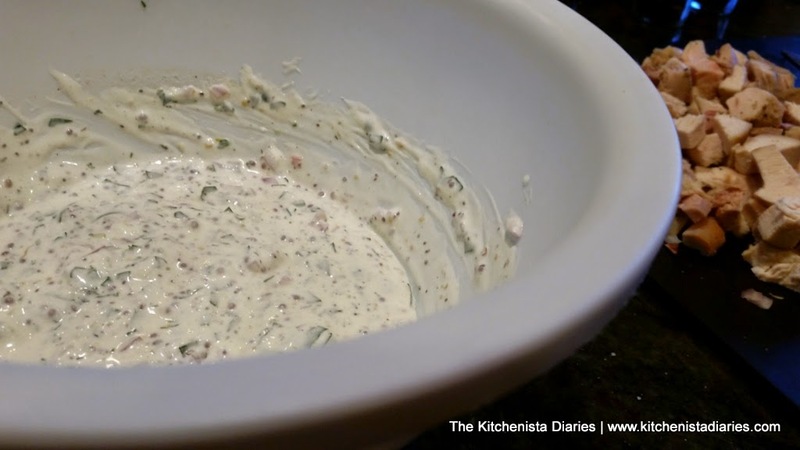 Full fat Greek yogurt is the key to making this substitute in my opinion. I don't think the fat free versions have enough flavor. It's actually pretty amazing how much you save just by swapping half out - one tablespoon of mayo has as much fat as a full cup of yogurt! Celery seed is something I started adding to my slaws and potato salad over the summer and it works really well here too. I don't care for raw celery too much, but the celery seed is perfect as a seasoning. Mix that all up and give it a quick taste test for salt and pepper. This actually makes a really delicious creamy salad dressing all by itself. 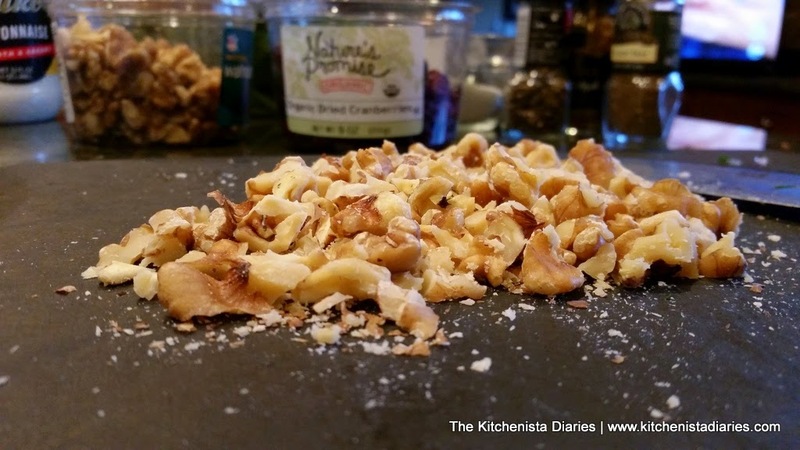 If your walnuts came whole, you'll want to chop them up before adding to the chicken salad. Not too fine, just enough that you get bits of walnut throughout. 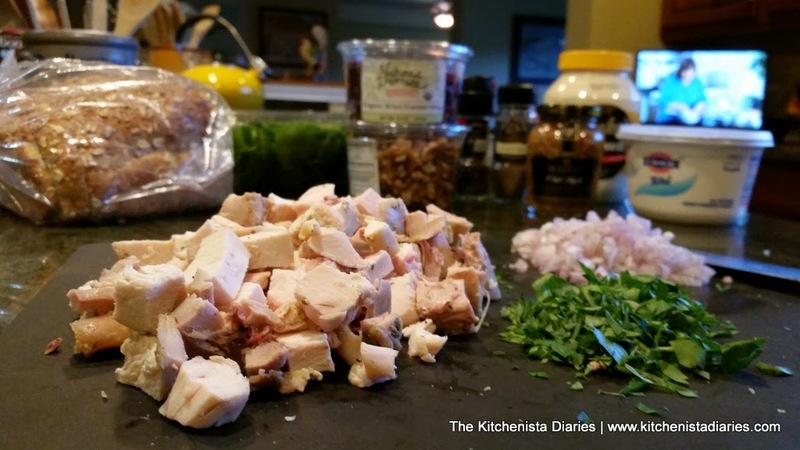 I like texture in my chicken salads. The walnuts add a nice crunch, and the cranberries add little chewy bursts of tart and sweetness. And gently toss it all together so the chicken is well coated. Give it a taste test, but if your dressing was adequately seasoned you should be good at this point! 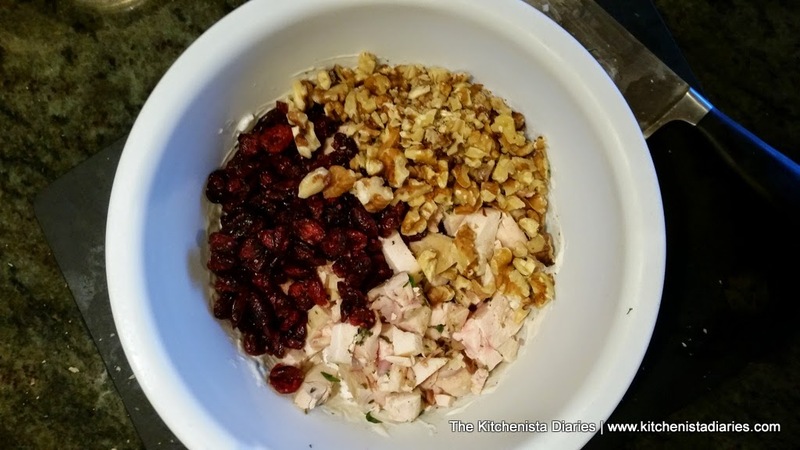 I love waiting for my chicken salad to chill before using, it's even better when the flavors get some time to meld and the cranberries plump up a little. It's also delicious eaten immediately, so do whatever floats your boat! I like softer bread for my chicken salad sandwiches, so I just barely toasted some fresh multi-grain bread and piled on some baby kale for greenery. Real bread also makes all the difference in a good sandwich. There's practically no nutritional value to commercial sandwich loaves and they're loaded with preservatives and chemicals anyway. A fresh loaf from the bakery section of your grocery store costs a couple extra bucks but it'll be way better for you and more enjoyable to eat. If you're really ambitious you might even try baking your own bread. That's on my bucket list. I know in the days of gluten free, low-carb everything, bread has become public enemy #1, but this girl here ain't giving it up. And that's it guys. I keep it super simple. This is something you can whip up in no time, and it doesn't need any crazy accompaniments. 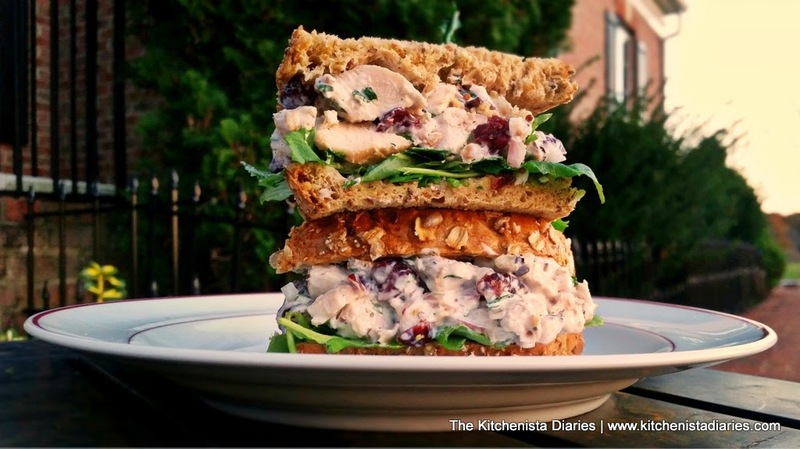 Good bread, fresh greens, and this hearty chicken salad. Perfection. Even Chappie was hoping to get a bite...photobombed by the dog! Happy National Sandwich Day y'all!